America has an abundance of foreign tourists (as anyone who has ever walked through Times Square can tell you), but apparently not as many as we used to—and it's costing us cash. While 62 million international travelers graced us with their presence last year (spending $153 billion, at that), from 2000 to 2010, the U.S. share of global travel spending dropped from 17.2 percent to 11.6 percent, according to U.S. Secretary of the Interior Ken Salazar in a recent opinion piece for the San Diego Union-Tribune. In an effort to entice foreigners to travel (and spend) in the states, Brand USA, a public-private partnership created in 2010 to increase tourism, launched “Discover America,” the U.S.’s first-ever global marketing campaign, yesterday. To kick off the U.S.A.'s new message, “Land of Dreams,” a twangy, folky, upbeat song written and performed by Roseanne Cash (yes, that’s Johnny’s daughter) will initially serve as the campaign’s anthem. (Download the mp3 here, for free.) 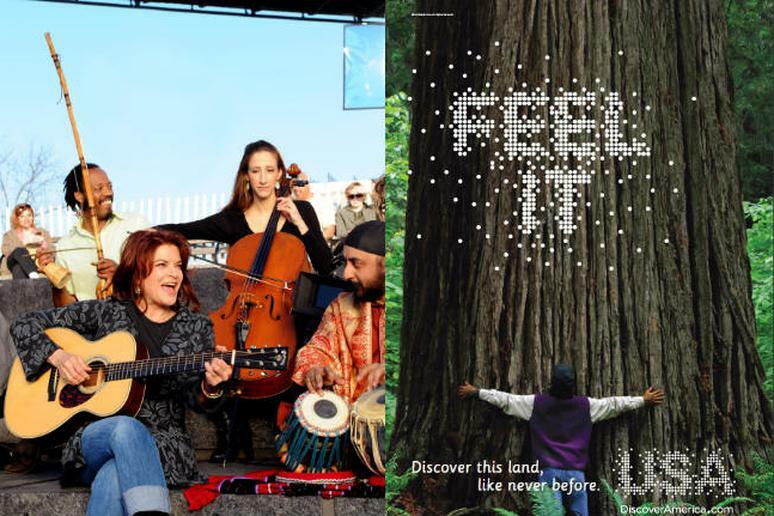 The accompanying video broadcasts America’s environmental diversity—presenting locations from the Brooklyn Bridge to the redwoods of Northern California—and cultural diversity—showcasing two men cozying up on a streetcar, women in headscarves and immigrants from across the globe singing with Cash. Discover America plans to inspire foreigners to visit by “highlighting not only the destinations, but more specifically, the experiences a traveler might have–Memphis barbecue, the scenic Hana Highway in Maui or baseball Spring Training in Florida.” It also aims to entice tourists to all 50 states and U.S. territories, including locales “not traditionally visited by international travelers,” according to Brand USA. The campaign will initially target the UK, Canada, with ads launching on May 1, and Japan, with ads launching May 7. Television clips, billboards, and social media will follow.